"Sampath Speaking" - the thoughts of an Insurer from Thiruvallikkeni: crowds at Chepauk - IPL 12 - CSK ku oru periya visil adinga !! crowds at Chepauk - IPL 12 - CSK ku oru periya visil adinga !! Triplicane (as Assembly Constituency) existed from the first General elections in 1952. From then on, the winners were : 1952 AM Sambandam (INC); 1957 KSG Haja Sheriff (INC); 1962 VR Nedunchezhiyan (dmK); 1967 VR Nedunchezhiyan; 1971 VR Nedunchezhiyan; 1977 M Aranganathan (DMK); 1980 KSG HajaSherif; 1984 Abdul Samad (DMK); 1989 NanjilMahoharan (dmk); 1991 Mohd Asif (AIADMK); 1996 Nanjil Manoharan; 2001 SAM Hussain (DMK); 2006 Sayeed Bader (AIADMK) ~ then Triplicane got merged with Chepauk becoming ‘ChepaukTriplicane’ – in 2011 & 2016 it was J Anbazhagan. It is with deep sense of anguish the residents of Triplicane received the news of realignment of Assembly constituencies – a la – removal of Triplicane constituency itself. .. .. from Triplicane, to ‘Chepauk-Triplicane’ was bitter – from South Chennai suddenly the area became ‘Chennai Central’. If we can get away – the only solace was alignment with Chepauk stadium … MA Chidambaram stadium to be precise. We have seen so many first division matches, local tournaments, Buchibabu, Ranji, Duleep, Deodhar trophy matches and then Tests (Pongal Tests !) .. Test No. 708 – India won by 4 wickets against England; Test No. 752 ever remembered by that classy knock of Vishwanath; great bowling of Andy Roberts and the defeat (100 runs at that) suffered by Clive Lloyd against Pataudi led Indians in 1975; Test no. 841 Kalicharran led WI lost to Gavaskar captained India in 1979; Test no. 869 – grand Indian win against Pakistan in 1980 – Kapil Dev Man of the Match, SandipPatil made his debut; Test no. 1089 Vivian Richards led WI lost badly (255 runs) to Ravi Shastri led Indians – Hirwant made dream debut taking 16 wickets – WV Raman and Ajay Sharma also made their debuts…. ~ all Indian wins …. Not the only link… all Chepauk tests… and more importantly the Pongal Tests !!!............... the ground at Chepauk has been in existence from imperial days – the first ever test here was in 1933-34 when Douglas Jardine played CkNayudu led team. Crowds have always come in large numbers ~ it is not only the numbers – they are reputed to be most knowledgeable and appreciative.. but the high rise dividers, barbed fence et.al. gives a different feeling. In 1970s – remember that the stadium had double-layered fencing – separating the spectators from the playing arena. Yet, when an Indian scores a century, a couple of people would scale the fence, get down, run, reach the player to congratulate them on their performance. Chepauk those days was spacious – the B & C stands had no chairs; spectators used to carry bedsheets along squatting on the huge concrete steps much earlier before the game started. The stadium had huge pillars, round in shape – so huge that perhaps it would require four persons holding hands to round them. They were the impediments too as they would hide the view on some angles from the place one sat. .. .. and as we sat at least an hour or more before the start of the match – the stadium would erupt – someone has already spotted those gentlemen in black & white with caps – the Umpires .. it was festival mode. Sadly, there are not many Tests or ODIs being played here and crowds have started dwindling – Ranji trophy matches are played to empty stands. Indian Premier League is different – even with 3 stands closed by Court order, it attracts huge crowds. .. sadly, for 2 years there were no matches and then last year, only the first match could be played at CSK home ground, Chennai Chepauk – as politics ensured that matches had to be shifted to Pune venue. With the 12th edition of the Indian Premier League around the corner, Chennai has once again been taken over by Dhoni and Chennai Super Kings mania. Mahendra Singh Dhoni's ascent to dizzying heights put a small city like Ranchi inadvertently on the cricket map. From the eastern state of Jharkhand, MSD has become the heart-throb of the city. On Sunday evening (17.3.2019), ahead of a CSK practice match at the M. A. Chidambaram Stadium, the serpentine queues outside the main entrance could be mistaken for an eager audience ramping up to an international match.The team bus arrived at the venue, to delirium. Every spectator on the periphery, unfazed by the gruelling heat and humidity, crowded around to watch.Fans pushed and shoved. 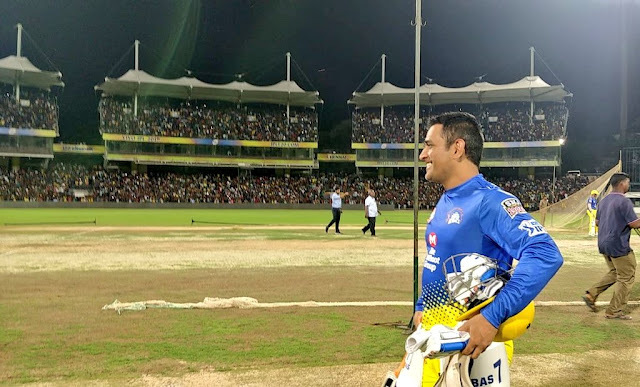 Security guards held hands, to stop the surge but to no avail.Inside, the noise from the three jam-packed stands immediately rose by several decibels as the CSK players made their way to the middle. It reached a crescendo when three-time IPL champion, Dhoni, marched out with his pads on during the innings break. Dhoni rolled his arm briefly, as the boisterous crowd swayed to the trajectory of the ball as it left his hand. Fans of those days transcended barbed fence barriers – for that single moment hand-shake with the achiever ~ but the security perception those days was different. Now comes the news that a 21-year-old college student breached security at the MA Chidambaram Stadium in Chepauk and ran towards Chennai Super Kings captain M S Dhoni on Sunday evening.Members of the CSK, an IPL franchise and last edition’s winners, were practising and fans were allowed inside the stadium to watch.They were allowed to occupy three sections of the gallery in the stadium.The youth, identified as Aravind Kumar from Madurai, crossed the security ringand ran towards Dhoni. Aravind wanted to shake hands with Dhoni and also hug him.Seeing the fan running towards him, the CSK captain started running away but later stopped to shake hand with him. Even as others tried to prevent Aravind from getting close to Dhoni, members of a police team providing security to the cricketers rushed to the scene and whisked away the youth.He was taken to the Triplicane police station.Police questioned him and found that he was a college student from Madurai, who had come to Chennai just to meet Dhoni.The video of the youth running to shake hands with Dhoni soon went viral on social media platforms. Police later let him go after issuing a warning. So ready for the IPL – Chennai Super Kingskku oru whistle podu ! ~ enga thalai Dhonikku periya whistle adinga !